Gijón - a coastal industrial city in the autonomous community of Asturias in Spain. The city is situated along the Asturian coast and is distinguished by the peninsula of Cimadevilla (the original settlement) which separates the beach of San Lorenzo and adjacent neighborhoods to the east from the beaches of Poniente and Arbeyal, the shipyards, and the recreational port and the Port of El Musel to the west. Its close to the other main Asturian cities, Oviedo and Avilés. The AC Gijón is located on the edge of the northern Spanish city and port of Gijon, two kilometres from the centre of town. Built in 2004 in a contemporary minimalist style, the hotel has 78 guestrooms laid out over four floors. The hotel has air-conditioned public areas and features 24-hour room service, complimentary newspapers and a coffee shop. The Botavara Restaurant is decorated in modern style and serves Asturian specialities and Italian dishes. Guestrooms have stylish, modern décor and all have climate control, high-speed wireless Internet connections (surcharge), complimentary minibars and satellite television with premium channels. Guests also benefit from coffee/teamakers and complimentary bottled water. Microwave ovens are available on request. 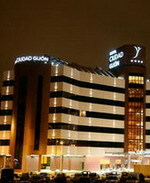 Newly opened in 2006, the modern glass and concrete Hotel Silken Ciudad de Gijón is situated in the centre of Gijón, one kilometre from the beach. Guests can relax with a drink in the bar, and then use the Internet to keep in touch with friends and family. At the Restaurant Ciudad de Gijón diners can enjoy international cuisine in a relaxed contemporary setting. Room service is available between certain hours and multilingual staff at the 24-hour front desk can advise on local amenities and attractions. The 134 guestrooms are spread over five floors and all have contemporary decor in light pastels with modern furnishings. Modern amenities include satellite television, Internet connections, climate control, safes, minibars, telephones, and bathrooms with hair dryers. 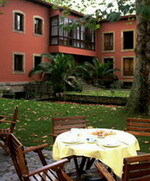 A former mill in Isabel la Católica Park - The Hotel is a century-old mill located in Isabel la Católica Park, one of the city of Gijón’s most beautiful spots. There is a pretty lake lending the space a great sense of harmony and tranquillity. Its proximity to San Lorenzo beach and Cimadevilla sailor’s quarter make it an ideal spot to enjoy unforgettable days. There is a large, bright, welcoming interior recreating the setting’s warmth in the rooms and spaces, whilst the windows offer a sense of the nearby ocean. Fabada stew is the top fare in the dining room, although beans come in other dishes. The seafood stew, black sea bream in cider, Asturian stew and hake are also a highlight. Rice pudding, frixuelos (cream-filled crepes) and casadielles (pastries with walnut paste) are part of the Hotel’s dessert selection. 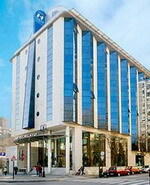 Hotel Tryp Rey Pelayo is located in the seaside town of Gijón, Spain, next to Isabel La Catolica Park. It is 300 metres from San Lorenzo beach and 1.5 kilometres from the harbour. Featuring modern architecture, this seven-storey hotel has a gym with fitness equipment. The 24-hour front desk has multilingual staff who can offer currency exchange, concierge services, and limited-hours room service. Wireless Internet access (surcharge) is available in the air-conditioned public areas and garage parking is available for a surcharge. Restaurant Cabo Torres serves regional specialities and international dishes in a contemporary setting. Snacks are available at the El Bargantin Bar. The 132 guestrooms are decorated in light colours and have traditionally styled furnishings.